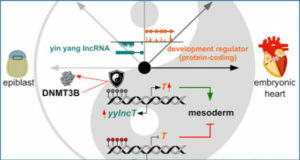 Long noncoding RNAs (lncRNAs) have emerged as important in cancer development and progression. The impact of diet on lncRNA expression is largely unknown. Sulforaphane (SFN), obtained from vegetables like broccoli, can prevent and suppress cancer formation. Here researchers at Oregon State University tested the hypothesis that SFN attenuates the expression of cancer-associated lncRNAs. They analyzed whole-genome RNA-sequencing data of normal human prostate epithelial cells and prostate cancer cells treated with 15 μM SFN or dimethylsulfoxide. 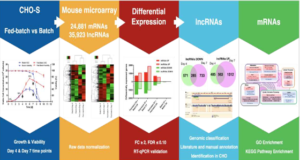 SFN significantly altered expression of ~100 lncRNAs in each cell type and normalized the expression of some lncRNAs that were differentially expressed in cancer cells. SFN-mediated alterations in lncRNA expression correlated with genes that regulate cell cycle, signal transduction and metabolism. 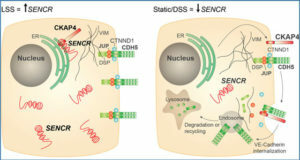 LINC01116 was functionally investigated because it was overexpressed in several cancers, and was transcriptionally repressed after SFN treatment. Knockdown of LINC01116 with siRNA decreased proliferation of prostate cancer cells and significantly up-regulated several genes including GAPDH (regulates glycolysis), MAP1LC3B2 (autophagy) and H2AFY (chromatin structure). A four-fold decrease in the ability of the cancer cells to form colonies was found when the LINC01116 gene was disrupted through a CRISPR/CAS9 method, further supporting an oncogenic function for LINC01116 in PC-3 cells. Venn diagrams showing the number and overlap of (A) the lncRNAs whose expression levels were significantly altered in PREC, LNCaP and PC-3 cells with 24-h SFN treatment. 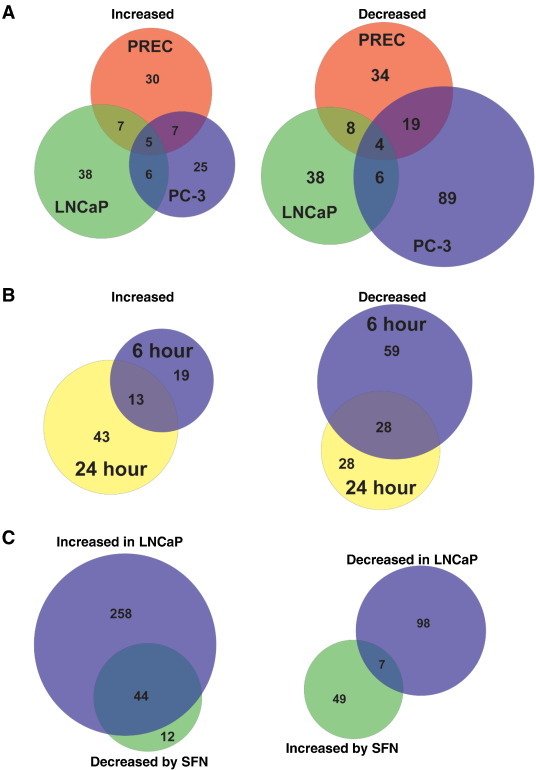 (B) Venn diagrams showing the number and overlap of lncRNAs in LNCaP cells that were significantly increased or decreased with either 6- or 24-h treatment of SFN. 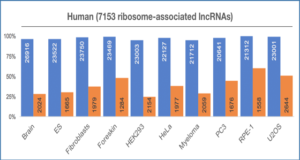 (C) lncRNAs that were either significantly increased or decreased in expression in LNCaP cells, relative to normal cells, and significantly altered by SFN in the opposing direction in LNCaP cells at the 24-h time point. 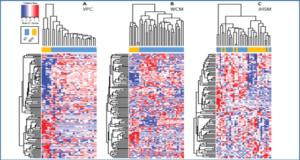 (A–C) Data are from a single condition (i.e., time point or cell line), but similar plots were observed at the (A) 6-h time point, (B) with PREC and PC-3 cell lines and (C) PC-3 cells (data not shown). 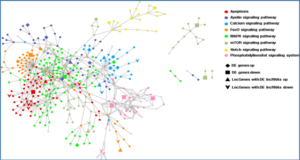 These researchers identified a novel isoform of LINC01116 and bioinformatically investigated the possibility that LINC01116 could interact with target genes via ssRNA:dsDNA triplexes. Their data reveal that chemicals from the diet can influence the expression of functionally important lncRNAs, and suggest a novel mechanism by which SFN may prevent and suppress prostate cancer.